Watch out as the numbers in the Magic Square change as you play the game. Random numbers appear and numbers can be randomly blocked. 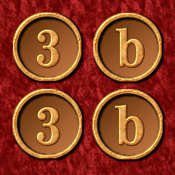 Difficulty degrees are EASY, HARD, and GENIUS 2-9, each having 16 puzzle levels. The higher Genius levels are difficult, bordering on the impossible. Be assured, however, that every level has a solution (if you can find it).